Failure is the name of the game. It’s the start of semester and we want our students to fail forward to succeed sooner. 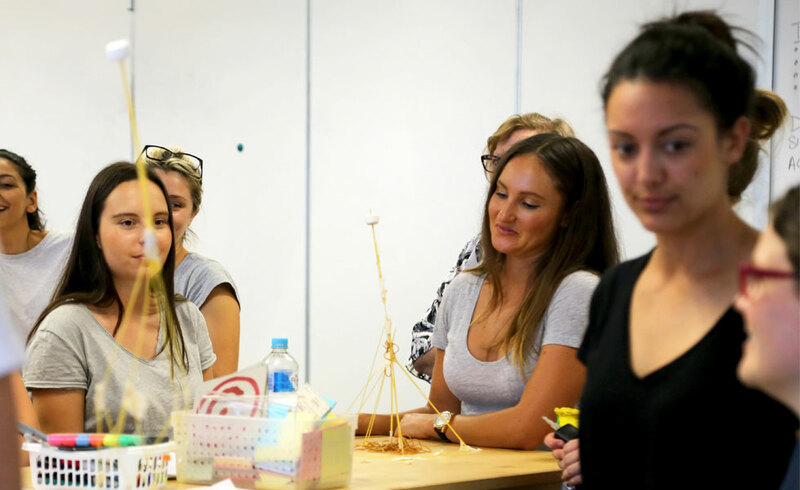 To kick off their thirteen week course our innovation minor students, non-designers all of them, completed the marshmallow challenge. 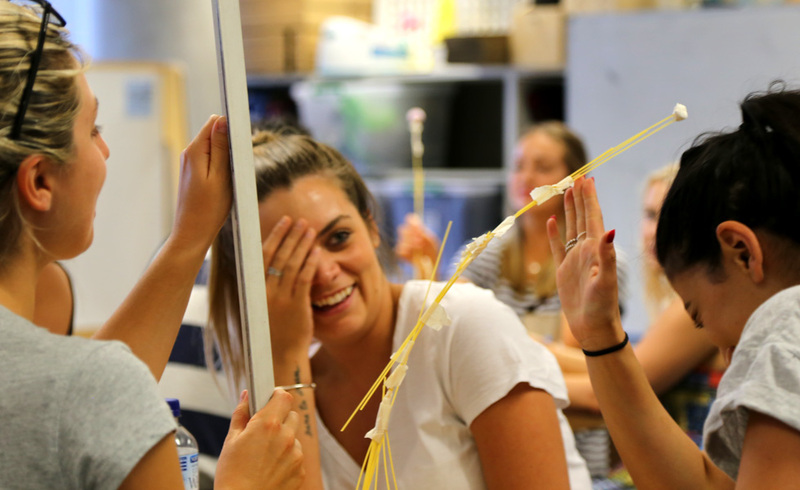 The famous marshmallow challenge involves taking 20 strands of uncooked spaghetti, one roll of tape, elastic bands and one marshmallow. The aim — to build a freestanding structure with a marshmallow on top. The tallest structure wins. The challenge originates from Dennis Boyle, the health and wellness partner at IDEO. He built on the Spaghetti Cantilever Challenge, where teams build structures out of spaghetti, and he ramped up the difficulty by requiring a marshmallow be added on top of the structure. Students learning to work together and fail forward. “Oh no no no!” the addition of the marshmallow almost topples this tower. At the end of the challenge there were a couple of successes and many structures that collapsed. 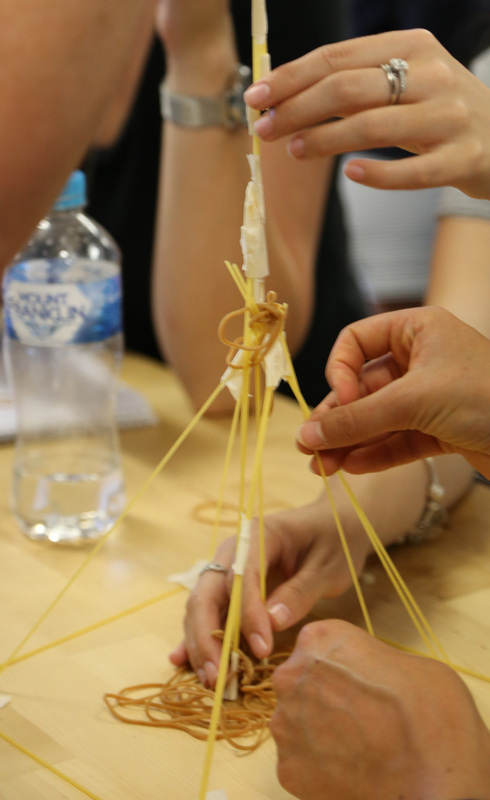 But, according to Tom Wujec in his Ted Talk “build a tower, build a team,” this result is common. 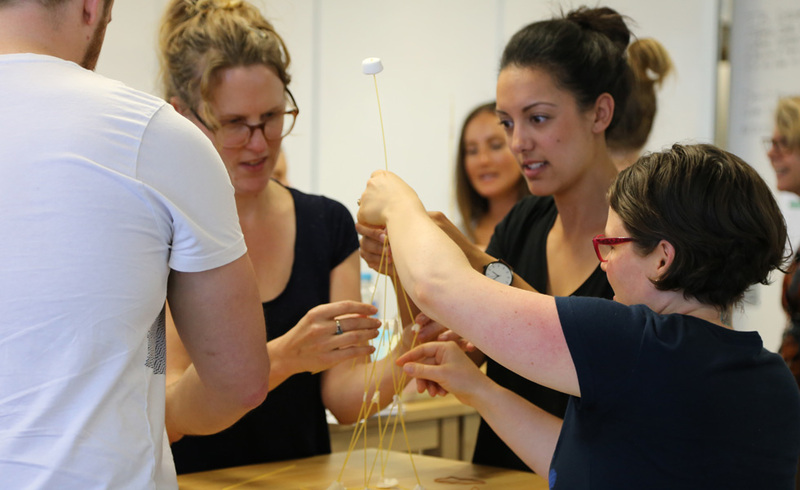 The important take away is that the marshmallow challenge gives us clues to the ingredients for successful design. 1. Fail forward to succeed sooner. Rather than sticking to one idea from the outset and slowly constructing it — it is better to test a number of ideas and fail. You may have 10 failures but then the 11th might be a success. Tom Wujec points out that kindergarteners have such a high success rate in the marshmallow challenge because they try and fail more. When the stakes are high this can put a dampener on innovation. Taking a playful broad attitude to design can lead to unexpected results. Employing a mindset that focusses on the process and exploration rather than the outcome leads to more creative, innovative designs. 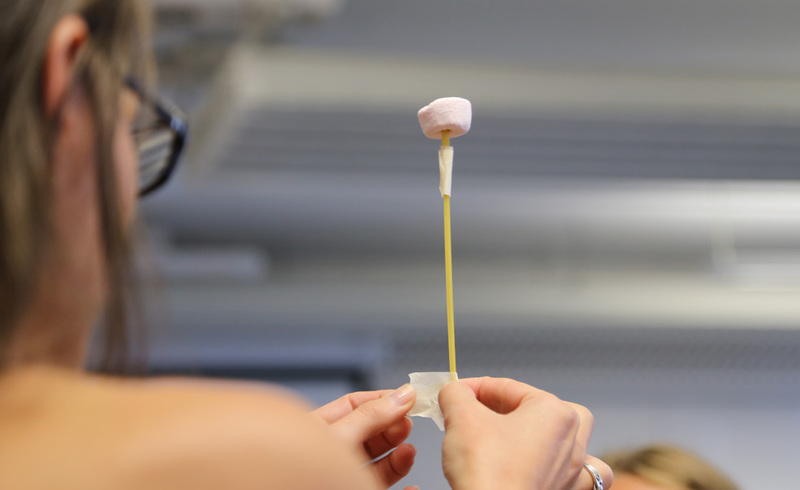 Our marshmallow teams had a flat hierarchy and this provided a good base for successful innovation. Having a flat hierarchy improves the chance that team members will accept new modes of thought. This includes being exposed to different approaches, opinions or ways of thinking which encourages better and deeper communication. This in turn enhances opportunities for leaps in thinking that support innovation. Our teams reflecting on the successes and failures of the challenge and their deeper meaning. This is just the first challenge our innovation minor students will undertake. This semester they will be prototyping catapults that adhere to a challenging brief. To complete this brief, it is necessary that they quickly learn how engineers work and the processes that will help them form a successful solution. The marshmallow brief has proved to be a quick and effective tool to give them a taste of this. However, there will be many challenges to come and we will cover them here.